We have a huge selection of Magnetic Sheeting Rolls that can be purchased By The Foot, in 10 Foot Rolls, 25 Foot Rolls and in 50 Foot Rolls. Our Magnetic Sheeting with Adhesive is available with Indoor or Outdoor adhesive. Outdoor Adhesive Magnetic Sheeting is ideal for outdoor use due the material withstanding weather conditions and sun exposure. Our Flexible Magnetic Rubber Roll is made from Strontium magnet and rubber and is cast together to form a continuous sheet or strip which can be used for a vast array of end applications. It is available in strip, sheet and individual pieces and comes in variety of thicknesses. It is sold by the lineal metre, by the roll or by the sheet. Our magnetic roll rubber sheeting has a top face that is either white, coloured, plain brown or has self adhesive backing. It is easily cut to size with scissors or a Stanley knife. Flexible Magnetic Rolls are available in a wide range of colored vinyls, great for displays and die cut shapes. From simple applications such as refrigerator magnets and crafts projects, to more demanding uses such as signage and point-of-purchase displays. .012″, .015″ and .020″ – Ideal for advertising specialties; lowest cost and weight. .030″ – Recommended for vehicle signage; strong enough for wind sheer at highway vehicle speeds. .060″ – Customer preference for applications requiring higher strength and thicker profile. Note: Peel strength not rated. 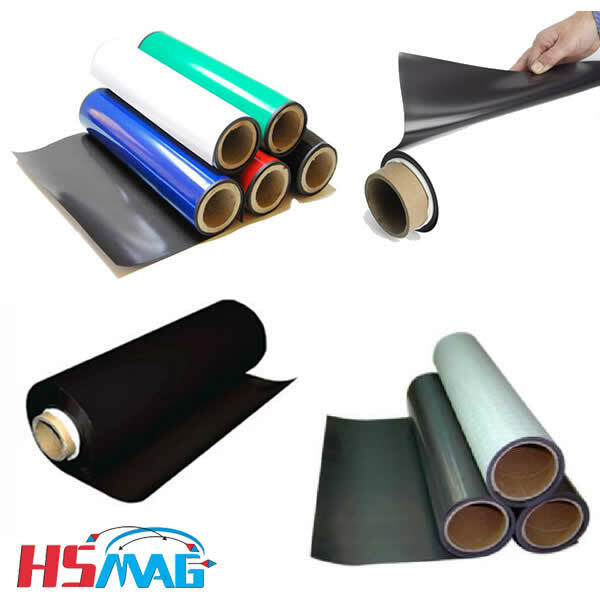 The popular thickness range of flexible magnet material is 0.4-1.5mm, but thicker material is available in high energy. The thicker the material the greater the pull. It is not in direct proportion, but the thicker the material the greater the pull increase. Eg:0.75mm thick material has a pull of 44 gram/cm2 and if proportional the 1.5mm thick material would be 88gram/cm2, but in fact it is actually far higher at 140 gram/cm2.